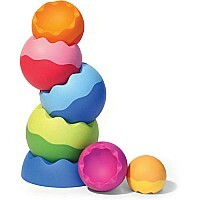 Picture those chubby little hands stacking, spinning, balancing, and toppling these wiggly wobbly curvy shapes! Highly “grippable,” six weighted pieces neatly nest and spin. What a tactile, textural, visual delight for discovering minds. They’ll be fascinated by the magic of motion they create. Award-winning and safety tested, colorful Tobbles will inspire and enliven your budding builder. Traditional blocks will never again stack up! From Fat Brain Toy Co for ages 6-24 mos.